Every time I drive in my drive way, I look at all the leaves covering the grass. I feel both frustration and anticipation as I think about being ready to plant my garden in the spring. 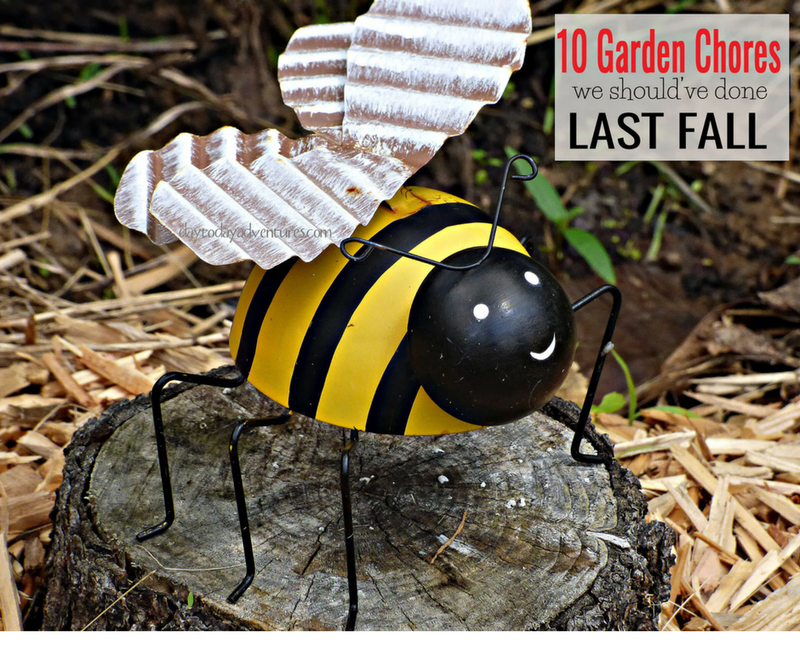 There are so many things that need to be done in a fall garden and this is my list that I wish I had accomplished last fall! I can’t WAIT to get outside this spring! AND Oh there is so much to do out there! My mother-in-law always says she hates spring. I've never agreed with her but I can understand her perspective this year. There’s just too much to do and its easy to feel overwhelmed. I have always felt that way about autumn. I never get all the garden clean up done before the cold weather arrives. But spring? I LOVE spring. Last fall was not the greatest for me as I was trying to decide if I was ready for hip replacement surgery. I did more sitting than working outside. We finished up canning the tomatoes and harvesting the pumpkins and that was about it. So I have a long list of things to do on these sporadic warm days we are getting as winter finishes up. 1. Rake leaves--we never got the leaves raked and spread on the garden. I'm so thankful that we have a pull behind rake for our mower! It makes it go a little faster. 2. Pull dead plants--there will definitely be some volunteer tomatoes and marigolds this year because we never got the dead plants or rotting fruit cleaned up. Should be an interesting garden! 3. Move mulch around all our trees—we have a HUGE pile dumped for us by the electric company that needs to be placed in a more useful location than beside my driveway. 4. Put a new layer of hay on the garden--love the way this worked last year. Where we kept the hay thick enough to smother the weeds it was great and it greatly reduced our watering. 5. Prune apple trees before new growth starts--ongoing task year to year. 6. Finish painting the trim from painting our house last year. 7. Pull weeds from my flower garden & put down more mulch. 8. Trim around our fruit trees in the “orchard” and mulch inside their little cages. 9. Kill off the grass by the front of our driveway so I can have wildflowers instead of weeds. 10. Plan what to put in the traditional garden & square foot gardens in 2016. There are many more tasks that I could list. These are enough to get me motivated on those warmer days. I’m going to post this list so when the kids are just laying around I can delegate some of these chores to them. Knowing what to do is most of the battle! Do you need a guide to start a garden? You might be interested in THIS Back to Basics bundle that is starting January 17! If you were to buy each of these resources separately you’d pay over $500, but for this short sale it’s 92% off! But only until January 23rd--after that it is gone. This is the perfect winter reading to do while you wait for spring to get here! Need some Garden Therapy? Go check out these related posts!